A winter wedding may sound a little bit chilly, but it looks like it’s taken out of fairytales. The icy patterns and the white and blue combination allow you to put your creativity to work and enjoy some exquisite designs for your big day. Today we are going to have a look at some winter wedding ideas for a truly magical event. An original idea for your winter wedding is to add gingerbread cookies to your dessert table. People will love the addition of this Christmas treat and who wouldn’t love to grab a bite of gingerbread? You could complete this aspect with other decorations in the shape of cookies or gingerbread figurines. 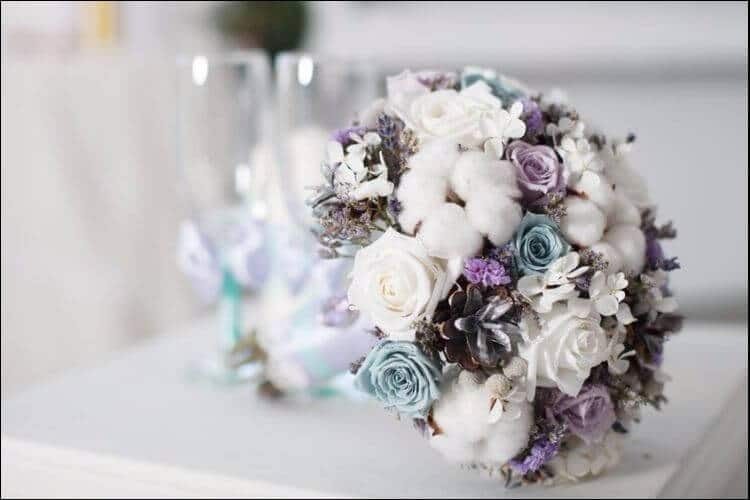 Even though the typical colors for a winter wedding are white and blue, with some gray variations, this doesn’t mean you must stick to them. Adding some green touches will make the entire ceremony seem livelier. 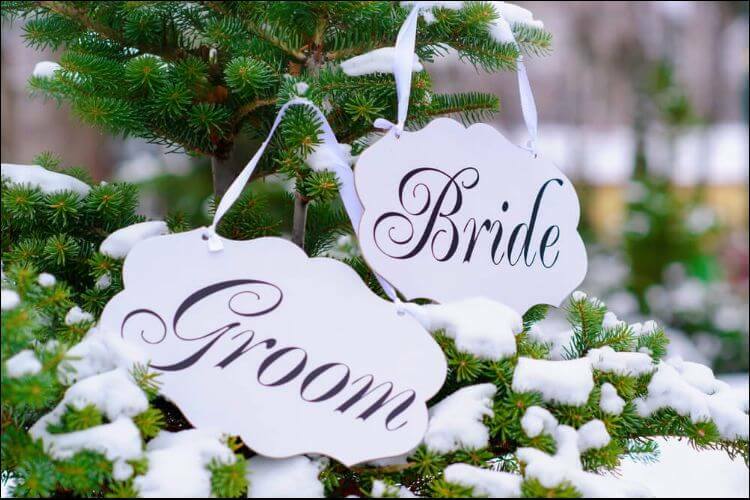 One of the most useful winter wedding ideas is to add small pine tree branches to the name tags at the tables, for instance. Quite an uncommon plant to appear at a wedding, mistletoe could be an original solution if you’re looking for winter wonderland wedding ideas on a budget. 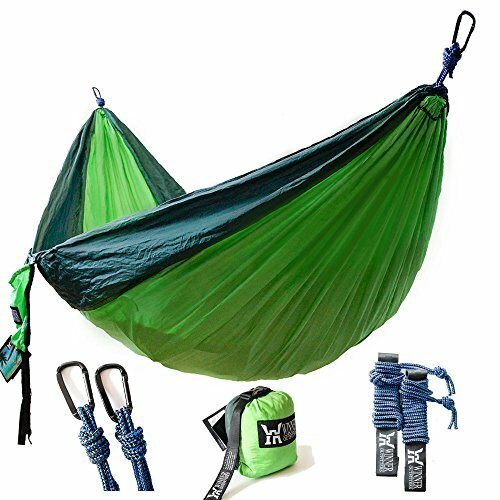 Hang it around the location and make sure people have enough space to kiss under it. You can even make some garlands or table decorations, depending on your inspiration. What’s better to keep you warm through your winter wedding than fur? Of course, natural fur can be quite expensive, and many animal lovers reject it, so the faux one is an excellent alternative. Scarves and wraps made of it will surely add a touch of elegance to any outfit, even that of the bride. If you happen to have several, you can provide your guests with some as well. Choose neutral colors that would fit the rest of the decorations. One of the winter wedding ideas on a budget that many people choose is to use branches and greenery. Instead of spending a lot of money on various decorations, you can improvise with what you have. A bunch of dried branches can become magical if you just add some Christmas lights on them. At the same time, adding green branches from place to place will significantly change an otherwise dull décor. If you’re feeling crafty, you can have your own DIY wedding wreaths and add branches to them. If you want to bring a touch of color to your winter wedding ceremony, you can use berries as decorations. For example, take a clear bowl, add a bunch of berries and green leaves and place a candle in the middle. The effect will be special, and you won’t need to spend extra. Alternatively, you can also choose small bouquets of red cranberries to decorate the area. Even if you’re not including any cinnamon treats on your wedding desserts table, you can take advantage of its smell. Buy plenty of cinnamon sticks and wrap them around candles. Make sure they won’t catch fire when the candles start to melt. At the same time, don’t overdo it since there might be people who dislike the smell. 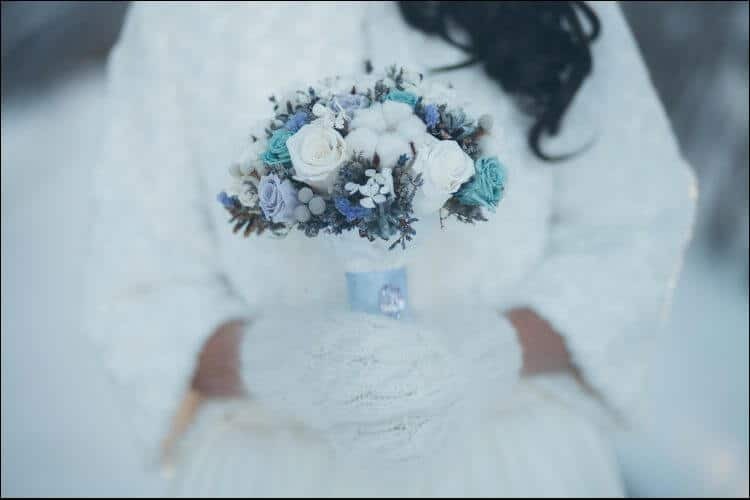 One of the best winter wedding ideas that will keep you warm through your big day is to use white gloves. You can play around a little with the material. From satin to silk and even some cozy knits, feel free to match the gloves to the dress. If you think the knitted ones are too casual for such an event, kick up their style with an elegant brooch. 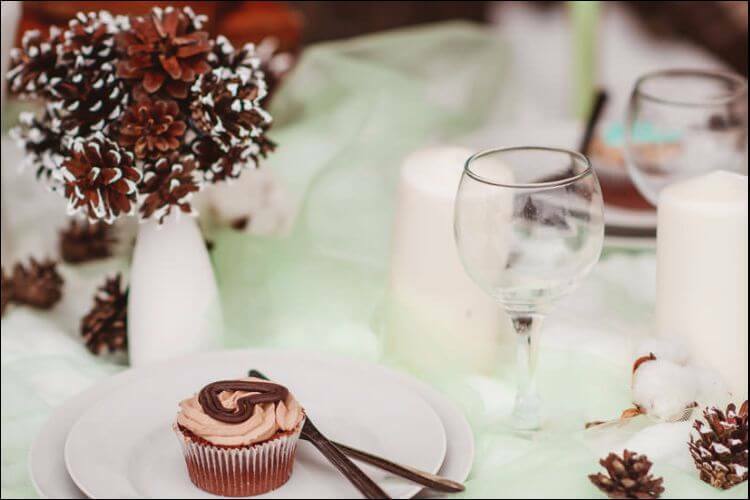 There’s no place and time more suitable for a hot chocolate bar than a winter wedding. 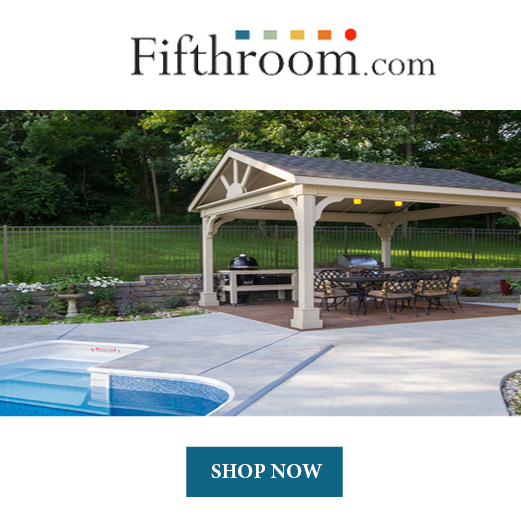 Your guests need to face the cold outside, so they’d love to get a hot fix. Prepare the bar with all the popular ingredients: extra cocoa, sugar, milk, marshmallows, etc. Add cinnamon sticks and powder and anything you know your guests might enjoy. Shift a little your wedding décor to a Christmas atmosphere by including some fir trees and candles. Big or small, it doesn’t matter, the more you add, the better! However, it’s important to pay attention to safety issues. Don’t place candles too close to fir trees to avoid the risk of a fire. Moreover, this idea may not be suitable for your event if you have plenty of children invited. 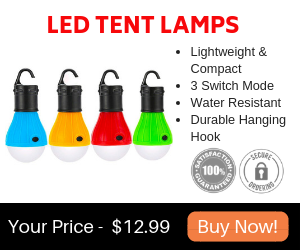 As an alternative, you can use electric candles that will create the same atmosphere. Even though it may bother you or your guests, snow is truly beautiful. Take advantage of this magical detail of your event and use it to the fullest for unforgettable pictures. If it’s not snowing, you might want to consider using some fake one. 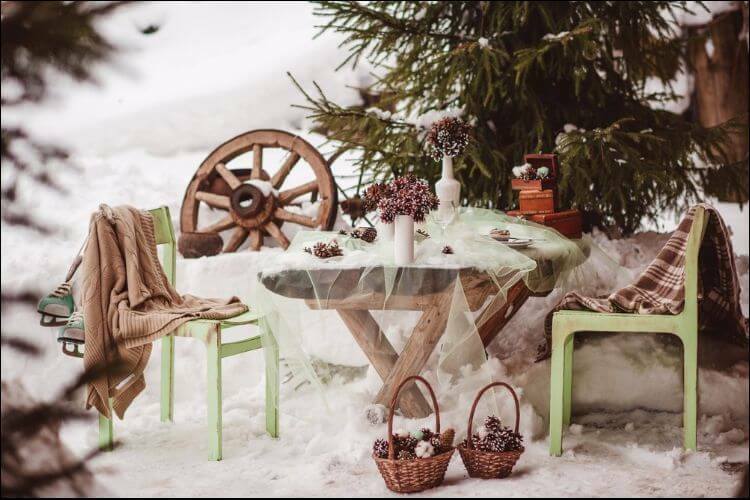 There are plenty of beautiful combinations you can make, with the rings placed in the snow, snow falling on the tables, etc. Simply let your imagination run wild and create an amazing wedding photo album. If your wedding event takes place around Christmas, it’s a good idea to use small Christmas trees as centerpieces. The combination also allows for some red splashes of color here and there, which is even better. You can continue the Christmas look with other specific garlands strategically placed throughout the set. Why not use typical Christmas ornaments? It’s perhaps one of the most unusual winter wedding ideas, but it’s original and inexpensive. You can hang transparent decorations shaped like a sphere or a star everywhere. Another advantage is that you probably already have plenty of decorations lying around the house, so you can put them to good use instead of spending money. We’re sure one of the most popular winter wedding ideas would be to organize a snowball fight. It would be very fun, and the children would love it for sure. However, you might want to do that towards the end of the party since your wedding outfit may not be impeccable after this round. Moreover, the pictures you have will be memorable. Marshmallows look cute and you can use them for something else besides the chocolate bar. Pull a string through them and hang them as a backdrop. It’s a simple solution to having great decorations, especially if you’re looking for winter wedding ideas on a budget. 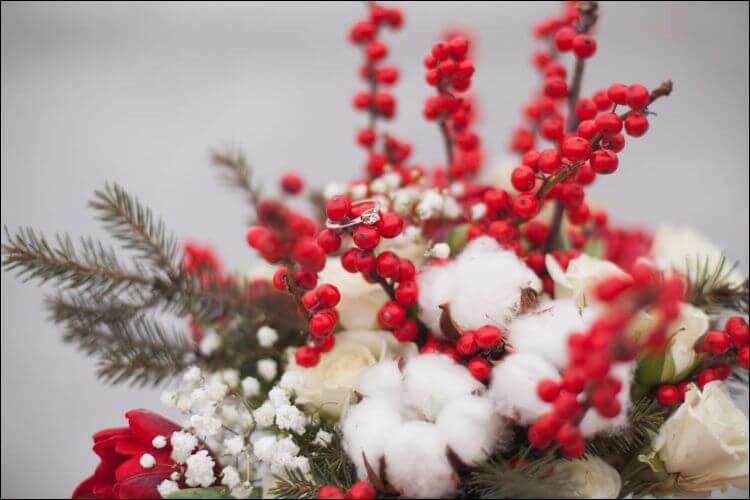 There are some expensive winter wedding decoration ideas, but in the end, it all depends on what you want to spend your money on. For this idea, you only need to gather as many pinecones as you want and get some spray paint. Randomly colored pinecones in pink, yellow, blue, and green will brighten up the entire atmosphere. At the end of the party, you can even hand them out to your guests as a souvenir. If you have children in the family, they’d love to help you with spraying them. Alternatively, you can use glue and cover them in gray glitter for an extra touch. Among the most delicious winter wedding ideas, you can also find the snowflake decorations used on the cake. Usually made of fondant, you can color them in silver and bronze to contrast with an entirely white cake. Moreover, you can match the decorations to the ones you have on the wedding dress, for instance, to have a coherent theme. What can make a winter garden wedding more beautiful than some paper geode lanterns? You can do them yourself with a pattern you find online and some LED lights. Oversized ones are better if you need more light in the evening, for example. Since there are few fresh fruits you can find in winter, use some plastic ones and paint them completely white. A simple white paint spray isn’t that expensive, and a centerpiece made with the plastic fruits will fit the rest of the décor. Satin is always a great choice when it comes to winter wedding ideas. Don’t limit yourself when it comes to shades either! The December wedding colors usually include pastel shades, such as lavender, pale pink, peach, and so on. Delicate bows can turn a cold décor into an elegant and royal setting for a truly unforgettable wedding. The idea of a winter wedding may give you the chills, but things aren’t as bad as they might appear. A thick blanket of snow can turn any location into a great setting for your big day, and you simply must take advantage of it. There are plenty of winter wedding ideas you can choose for this event. From gingerbread decorations to a hot chocolate bar or snowflake decorations for the cake, winter-themed items can easily sneak into your general décor. Choose original ideas and everybody will remember your wedding for years to come!